For the June 2012 issue of their magazine, Reflections, the C S Forester Society asked me to write an article on what influence he had on my writing. The article is reproduced below with their permission. For me it all started with a slightly gruff and remote frigate captain. He was a man who lived his life bitterly aware of his own inadequacies, and in constant fear that one of his real, or imagined, weaknesses would expose him as the fraud he supposed himself to be. It was a wonderfully complex, yet understandable character and the fact that he shared a world that I then considered Nelson's was an added bonus, although if Hornblower had appeared in any other time or genre he would probably have been almost as compelling. As I progressed through the series I realised there was more to the central role than just a well defined personality: Hornblower changed. This happened both in the long term, with age and maturity, and the short, as when his throat clearing tactic for avoiding conversation was identified by Lady Barbara. I had yet to start writing myself, but the subtleties of character, and the way Forester's creation developed, still fascinated me. Comparisons will always be made with Patrick O'Brian, whose books are rich with an intricate and credible cast, but few are allowed to grow old, to mellow or harden with time, or even allow single events and experiences to alter them. Hornblower develops. The same traits may be apparent when a midshipman and an admiral, and there can be no doubt that the basic germ of character remains constant, but through the course of the series the anxious recklessness of youth merges beautifully into more dignified maturity and finally an accomplished, and slightly pompous, retirement. And it is a credit to his skill that Forester did not opt for the easy route and start the series with an adolescent soul; one that could age and ripen as years and experiences are gathered. In one of the later stories we have an aspiring, but socially naïve naval officer being blithely led into an unwanted marriage by a mixture of awkwardness and a dominating mother-in-law; contrast indeed to the successful but mildly crusty Commander-in-Chief heading for retirement that Forester had written about in his previous book. So there we have it, a totally absorbing central character whose military career, personal history, and dynamic personality is finely mapped: the archetypical nautical fiction series that was one of the first, and arguably remains the best. Many have come along since of course, in fact today Historical Nautical Fiction is among the faster growing literary genres, and often the same general lines are followed. But the “midshipman who becomes an admiral” can only really be written once, and as it has already been done so well, what else can a new writer do to make his mark? That was the dilemma I faced about twelve years ago. The Georgian period and specifically the Revolutionary and Napoleonic Wars had intrigued me for as long as I could remember, and I wanted to write a fiction series set in that time. 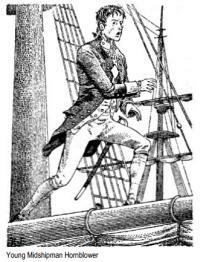 Hornblower's presence was both an encouragement and an obstacle; I loved the books, but knew I could never hope to emulate Forester's characterisation, yet still felt that the fictional world of frigates and hard tack; close blockades and landing parties was large enough to take one more contributor. My background to that point had been mixed, I had written in many fields with some success, but was principally known as a broadcast comedy writer. Consequently I didn't imagine that any prospective publisher would consider me worthy of the investment necessary to launch a new name, and the knowledge that the ultimate naval hero had already been created was always with me. So, rather than try to emulate or compete, I decided to have no central character at all and, steering even further away from the Hornblower series, set as many stories as possible during actual historical events. I'd also write about the entire crew, rather than a single man, or group of men. The action would be seen from all angles, from the lower deck seamen, to commissioned officers; marine privates, warrant officers, even doxies. By then I had read quite a bit of other writers' Historical Fiction and recognised that often it could be an ill used term, with the emphasis falling firmly on the latter. I'd make mine as accurate as possible — anything else being an insult to those who had originally served — and tell an actual story using real figures from the period, combined with my own characters. And if a truly riveting fictional personality did appear, one who might even take over the show and dominate to the point where the series could be considered about that one person alone, well then they would just have to go. I began to work on the first book and soon discovered that history is filled with opinions and beliefs; hard facts can be incredibly difficult to identify or pin down, and new research is constantly bringing up fresh little gems to contradict and confuse. Hollywood is responsible for many misconceptions while others have grown from folk tales and, I have to say it, historical fiction writers. Maintaining a credible story whilst avoiding such hazards was difficult, especially as new readers would require a good deal of explanation, and here again I benefited from reading Forester. The Happy Return is set almost in isolation, just two ships, and an otherwise empty ocean: effectively a blank canvas. Although Britain was at war with most of Europe, Hornblower was fighting his own private battle and only when the news that Spain had become an ally was he actually affected by the major conflict. This gave far more room for subtle explanation of shipboard life and terms, and a closer understanding of the characters, without becoming embroiled in the minor points of political or military history. I decided to follow a similar scenario with His Majesty's Ship, and, although I did give a little more attention to shore based life, and the current political situation, most of the action takes place aboard a ship involved in one single incident, with a crew I could properly introduce and really get to know. And so my “crazy gang” of characters gradually emerged. From senior officers, to volunteers third class, I began with a fair representation of a ship's complement, concentrating on one or two individuals in each department. Some have since featured strongly throughout the series, while others make more spasmodic appearances, and many more give just a fleeting glimpse. With so many men in the Royal Navy it was, at once, both a small and a large world; certain officers would attract followers, enabling me to move entire groups from ship to ship, but there was also the anonymity that such a disparate force can give, and plenty of scope for describing service life during the French wars. And it was then, and only then, that I fully appreciated a somewhat macabre advantage to avoiding the course that Forester has set and so many have since followed: I could kill people. It sounds harsh, but from a writer's point of view a central character can be very restrictive. From Ian Fleming to Arthur Conan Doyle the problem has been present; both writers grew tired of their hero and arranged his departure, only to be forced to rather shamefacedly resurrect them. Forester wrote out several minor and one major character, but I wanted no certainties. Every one of my players are extremely mortal; they may not necessarily fall in battle, some might simply leave the service, or transfer to another ship or station, but no one is safe. All are transient: everyone is expendable. This angle gave me unexpected freedom and the second book, The Jackass Frigate, was allowed to delve a little deeper into the actual history of the period. To date I have included the Bantry Bay invasion, the Battle of Cape St. Vincent, the mutinies at Spithead and the Nore, Duncan's ruse off the Texel, the Battle of Camperdown, the 1798 rebellion and Warren's action off Tory Island. I've also included several notable figures from the period including Jervis, Nelson and my own personal hero, Adam Duncan as well as spending almost an entire book aboard an East Indiaman. My publishing route proved just as hard as I had expected. None of the established houses would even look at a manuscript and, although several literary agents showed initial curiosity, they could not secure a mainstream publisher willing to support a new writer. Eventually a small local press took book two, The Jackass Frigate, and the series was finally launched, if a little out of order. Sales were good from the start, surprisingly so, as my promotional budget was very small. Jackass attracted attention worldwide, in fact, and came to the notice of Tom Grundner, a former US Naval officer turned writer. By then Tom had produced the first two books in his series about Sir Sidney Smith and compiled The Ramage Companion for a noted American house. He was also in the process of starting his own publishing company, Fireship Press, primarily to re-release forgotten nautical titles from the nineteenth century. He read His Majesty's Ship over the course of a weekend, and a contract followed on Monday morning, along with a request for rights for Jackass. There were a few problems from the outset; Tom's skill lay more in distribution and logistics, and the first offerings from Fireship were poorly copy edited. But despite this the series has proved popular, with all the books achieving good steady sales. Other notable nautical writers have joined the fold, including Linda Collison, Steven Maffeo and Christopher Valin, and Fireship is now a significant international publisher specialising in nautical fiction and non fiction, but also with a large general catalogue. Tom died suddenly in September 2011 and Michael James, a British born writer, now heads the company. Book five in my “Fighting Sail” series, The Patriot's Fate is about to be delivered and I am currently mapping out the scenario for book six. They will never compete with Forester's work, they were never intended to, and there certainly will be no central character as complex and fascinating as his. Hornblower has already been created, and could never be improved upon, but I am thoroughly enjoying writing about his times, and will always be grateful for the interest he first inspired.